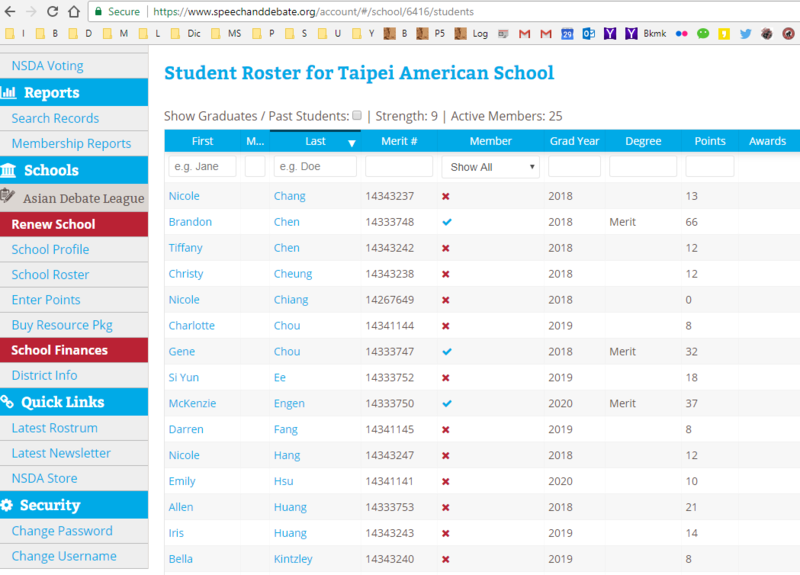 Asian Debate League, as the exclusive NSDA chapter advisor of all schools in Taiwan, has the ability to register and add individual students the NSDA membership. As such, ADL enrolls and manages NSDA points of all Taiwan students. ADL is also responsible for collecting NSDA fees from all schools and students in Taiwan and transfer the sum to U.S. NSDA annually. National Speech & Debate Association point menu is the same for all school level, and it can be earned from 1) Debate, 2) Speech, 3) drama, and 4) Community Service. A student competing at a tournament receives points for every round of competition according to the following scale: W(win)=4 points; L(loss)=2 points; N/D(no decision)=2 points. These records will be online permanently for your future references. Fifth place and beyond: 5pts.4pts. While competition rounds earn students more points, NSDA also stays true to its roots, encouraging involvement beyond interscholastic participation. Here is the scale for such speaking engagements, recorded in the “Service” area. One (1) point per presentation, up to two may be recorded in a day. Minimum presentation length is three minutes. Two (2) points per speaking engagement, up to two may be recorded in a day. Minimum presentation length is four minutes. 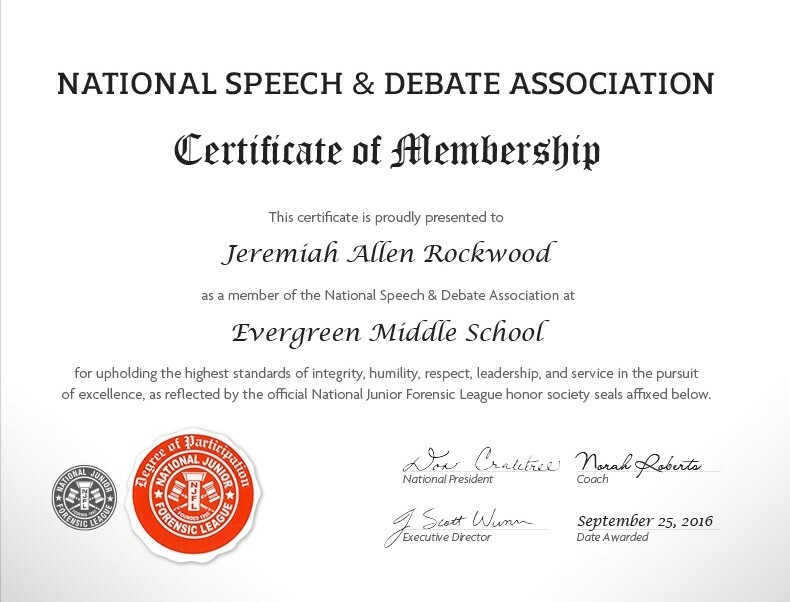 Just as in Boys/Girls Scouts, a different badge of honor is earned based on the level of students’ participation, a varying certificates of membership degrees are issued by the NSDA based on the level of students’ participation, so that students can list them as extracurricular accomplishments on their college application to prove their passion, dedication, and persistence in one activity. Student’s school pays NSDA one of the three options: USD $150 (or NT 4,500) for annual high school membership; USD $100 (or NT 3,000) for annual middle school membership; and, USD $50 (or NT 1,500) for annual elementary school membership. A student pays NSDA one of the three options: USD 30 (or NT 1,000) for one time elementary membership; USD 30 (or NT 1,000) for one time middle school membership; or, USD 30 (or NT 1,000) for one time high school membership. 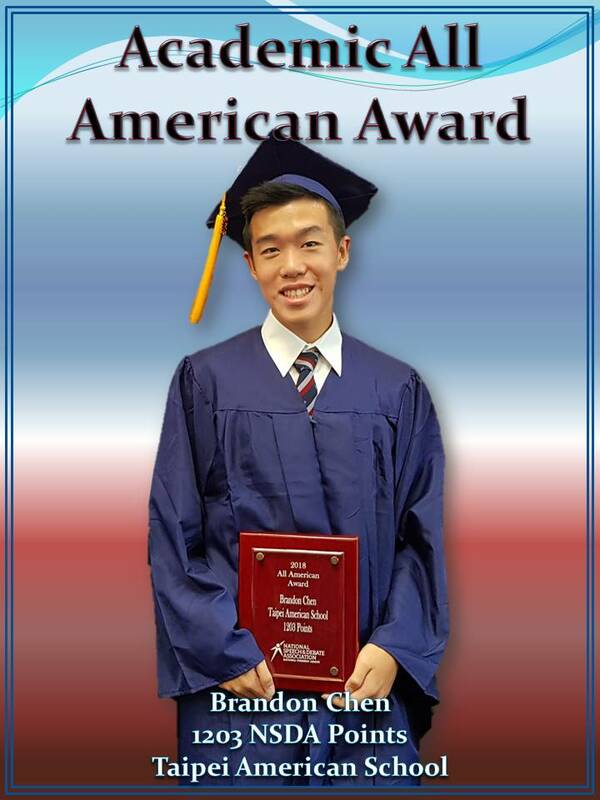 A student pays Asian Debate League NT1,500 once a year to A) record NSDA points and B) issue NSDA Certificates of Membership Degrees. Regardless of when you pay – e.g., if pay in the middle of school year – this fee covers service for the given school year ONLY and will not be extended to the next school year. 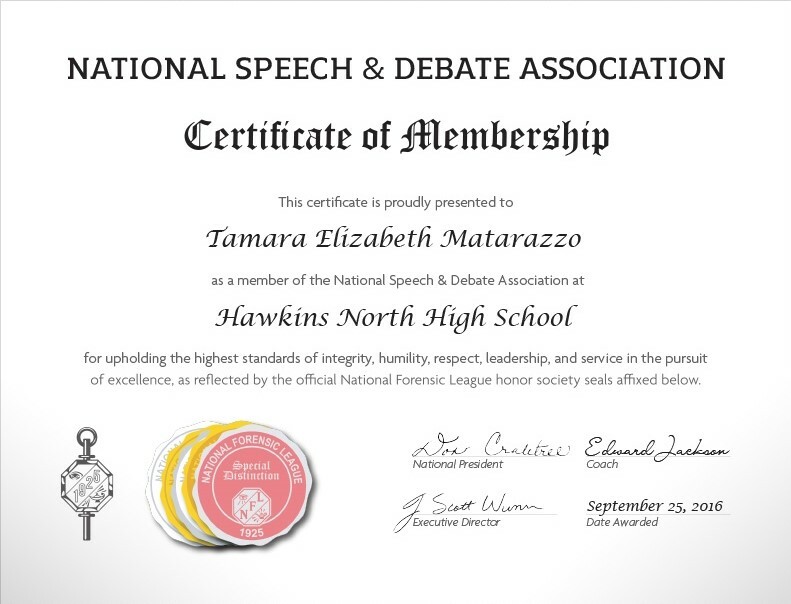 The points can be earned from any institute (e.g., church, community, school, NSDA tournaments or “even not NSDA” tournaments) and any place (e.g., Asia, America, Europe) for as long as it is related to speech and debate. Following is the structure of degrees of membership, along with the value each contributes to a school’s strength as an NSDA chapter.